Do you know you can actually get a whopping 4.5GB of data for just N500 on 9Mobile? 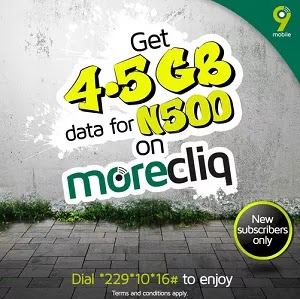 Yes it's possible so in this post, I will show you the code to get 9Mobile 4.5GB for N500 and how to be eligible for it. 9Mobile took to their social media pages this weekend to announce this new offer to their customers to enjoy super-fast internet browsing and downloading. It's a smart business trick to get more subscribers on its network as it only works on new 9Mobile SIMs. ✔️ After that, dial *229*10*16# for 4.5gb. This one-off data offer is valid for 5days. WHAT IS THE VALIDATION PERIOD OF THIS OFFER? This 9Mobile 4.5GB for N500 valid for just 5 days. It's unfortunate it's not 15days or 30days. SEE ALSO: 9Mobile 1GB for N200 Plan. Guys how do you see this trick? Can you get a new sim just because of a 5 day plan? This is very nice from 9mobile, i still feel they are the best and will continue to be.